Sealed. Thick item. LP shipping rates apply within Canada. Never opened, still sealed in original manufacturer's wrap. Original hype sticker still attached to front. Disc condition: NEW ! Never opened. 3-disc set with 24-page Booklet within SEALED Digipak. Case condition: NEW and SEALED! 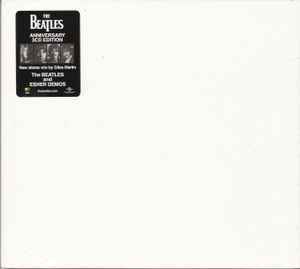 Embossed as "The BEATLES" on Front Cover. Titled as "The Beatles And Esher Demos" on spine. Black Hype Sticker has been covered by original retail price sticker, so it is likely damaged. Otherwise no holes or marks or folds on artwork or case. Includes upgrade to First Class Mail with Tracking for U.S. addresses! Factory sealed, precintado de fabrica.